Original Post: I’ve had a lot of visits to my previous post comparing these cameras – the Canon 7D, Canon 5D Mark II, and the Canon 50D – and since that really wasn’t much of a comparison post, but rather just a link to an impartial, technically based testing site, I’ll try to give a little more insight into helping you make this decision. Please note, this is aimed towards still photographers and not videographers. I know that videographers have different priorities when making this selection, and I am not knowledgeable enough to address them. I have written some updated comparison posts which also address the Canon 60D here and here. I’ve used the 50D and the 7D pretty extensively, so I can speak with a bit of confidence about them. I’m very familiar with the features of the 5D Mk II and how they compare to the other cameras, so I will discuss them too. I’ll address the 550D (Rebel T2i) at the end of this post. Also, all the precise specifications of these cameras can be researched online and compared, so I will discuss them on a user-experience level, but I encourage you to decide which factors are most important to you for further research. I know it is a long post with a lot to read, but if you are investing several hundred or thousands of dollars in a dSLR and lenses, you should be thorough! On a final note before I begin, you may have been convinced by forums, reviews, or online comments to question and compare image quality, auto-focus speed, ISO and noise, etc., but those factors are all nearly completely irrelevant. Each of these cameras has more than enough quality in all of those areas. Your choice should instead be based on your level and needs as a photographer, and on which camera best serves the way you work. If you wish to see this complicated choice summarized in an easy to read format, view this post (it is a bit tongue-in-cheek, but mostly accurate). And when you are done selecting a camera body, you can learn more about lenses here. While I have your attention, I want to mention that I have written eBook tutorials for the Canon 60D and for the Canon T2i, which cover ALL the Menu settings and Custom Function settings, with recommended settings, plus in-depth descriptions of how and and why to use the cameras’ settings and features in everyday use – Your World 60D and T2i Experience. Learn more about the eBooks by clicking on their titles. Also, please let me know about broken links in my posts, as they seem to mysteriously happen from time to time. Price and Obsolescence: First, you probably haven’t run out to get a 5D MkII because of its cost. As of 5/2010, the price is $2,500. AND, the 5D MkII dates from 9/2008, and is due for an upgrade, likely in 2012, maybe as soon as later in 2011. In some respects, the 7D – being newer – has better features than the 5D, such as the advanced auto focus and metering systems and faster frame rate. Not to mention the fact that if you wait around long enough, a 7D type camera WITH a full frame sensor but a lower price than the 5D is bound to come out! But you need a camera now, so let’s continue. The 7D is $1,600 or $1,700 depending on current promotions, and the 50D is about $1,000. The 50D however, is also the closest one to being replaced (by the 60D or whatever it may be called). This doesn’t mean that it isn’t still a very capable and feasible camera – people are still happily using 20D and 30D cameras, just that it is reaching the end of its production life. So as far as the newest model, that is the 7D (and the 550d/ T2i). Megapixels / Image Quality: Regarding megapixels, it really isn’t much of an issue unless you plan on printing out billboard size prints. All of these cameras have more than enough megapixels and image quality for most photographers’ needs. The 7D is at 18mp, the 5D Mk II at 21mp, and the 50D at 15mp. I have found that more megapixels give you more lee-way to push and pull the image around in Photoshop before it starts to fall apart and look over manipulated. In this respect there is a significant difference between 8 megapixels of a Rebel XT and 15 or 18 mp. The 8mp barely allow you to do a regular amount of exposure, contrast, and color correction before it starts to really show, but there is little to be concerned about between the 15mp of the 50D and 18mp of the 7D (unless you are a hard-core pixel peeper, in which case you will be deeply offended by these kinds of statements). Be aware that sensors with more megapixels more readily show the shortcomings of cheaper lenses, and thus demand higher quality lenses, like the Canon L series, for the sharpest, most detailed image across the entire frame. From experience, I can tell you there is a huge improvement in clarity, color, and overall image quality when using an L lens with a 50D or 7D. HD Video: If you are concerned about HD video, then you choice is narrowed down to the 7D and the 5D Mk II. With firmware updates and 3rd party Magic Lantern firmware, they are about on par as far as frame rates etc., so cost and sensor size is again the differing factor here. If you are not going to need or use video, it is definitely worth considering the 50D, which will give you 85-90% of the still photography features and performance of the 7D at a much lower price. Features, Customization: Being the newest camera, the 7D has the most advanced features. As I mentioned above, it has an advanced auto focus system, providing more focus points, more focus modes (single point, spot, zone, expansion, etc.) and numerous options for how the focus points perform and select and track a subject. I’ve written a bit more about these features here, along with links to additional resources. There are advanced custom functions for auto focusing and tracking, flash control (the 7D is the only one which offers remote flash capabilities, which will save you a couple hundred dollars on Pocket Wizards if you are going to use this), and customization of buttons and displays. Again, I’ve explained a lot of these features in this post. Read through them. Do you understand them? Are you going to learn them? Are you going to need and use them? Probably not. They are nice to have, make you feel like you have a really powerful camera you are in control of if you learn how to choose, set and use them, but in everyday shooting I rarely, if ever, make use of them. The live view (which the 50D has as well) and the built in level are cool, but will you ever use them? I don’t. (The built in level will be most useful to landscape photographers). Of all the features and customizations of the 7D that are not on the older 50D, the only ones I miss are the remote flash capability, the grid overlay in the viewfinder, the larger more inclusive viewfinder, the spring loaded doors of the 7D, and the ability to switch functions of the top dial and back dial in Manual mode. (It is such a nice feature on the 7D – since I use Av mode most of the time, the top dial controls aperture. But when I switch to M mode, the top dial now controls shutter speed. So with the 50D I have to overcome muscle memory and use the back dial for aperture. But with the 7D, one can switch the dials’ functions.) Unless you are an intense sports or animal shooter who needs to customize how the camera selects and auto focuses on a moving object, how it addresses an object that moves in front of your subject, and how fast it responds to this new object before it addresses or ignores it, then you don’t need these features. And when you compare the features of the 7D to the 5D or 50D, you find that the older cameras are not outdated dinosaurs as forums will lead you to believe – but rather they also have many of these features and customizations as well. As far as all the new auto focus features of the 7D, it turns out they barely mattered to me because I manually select my auto focus point 99% of the time. I don’t want the camera necessarily focusing on the closest object, and it certainly does not know what I wish to focus on, so I don’t leave it up to chance, and I select the point myself. Therefore I rarely use any of these advanced auto-focus modes. In addition, it is much easier and quicker to manually select an auto focus point on the 5D and the 50D when you are selecting from 9 focus points rather than the 19 focus points of the 7D! However, if you photograph fast moving objects that you would prefer the camera to locate, track, and properly focus on, most of the time, all by itself, then the 7D is the camera for you. Also, note that due to the fact that the 5D is a professional body and not a consumer level camera, it does not have a built in pop-up flash. If you plan to use a flash with it, you will need to buy the Canon 580EX II flash (which you should do with any of these camera anyway). Metering: The 7D has an advanced metering system compared to the 5D Mk II and the 50D, and this is actually one very important advantage. The 7D has a more precise 63 zone metering system vs. the 35 zone system of the 5D and 50D. With the 7D, I can confidently leave it on evaluative metering 97% of the time, and it meters the subject exceptionally well 98% of those times. Canon claims that it will meter properly for a wide variety of subjects, including back lit and extreme contrast subjects. I have found this to be true. Compared to the 50D, this is significant. I have found that the 50D regularly overexposes by about 1/3 or 1/2 a stop, and I have exposure compensation on -1/3 all the time to avoid blown out highlights (except in dark situations, where it tends to under-expose). Also, the 50D just does not always correctly expose in unusual or difficult lighting situations. And for dramatic and powerful photos, you want unusual or difficult lighting situations, so I have found that I am using exposure compensation, or having to change to center weighted, partial, or spot metering often. While this is sharpening my metering eye and skills, it is a pain and it leads to the risk of lost shots. I would prefer that it just got the exposure right the majority of the time, as the 7D does. (I have subsequently found that using center-weighted averaging mode on the 50D all the time results in more consistent exposures than evaluative metering mode). You can learn more about the various metering modes, and when to use them, in this post. 550D / Rebel T2i: The Canon 550D or Rebel T2i has some impressive specs, and shares many features of the 50D and the 7D, and it is actually the newest model of all of them. It has 18mp and HD video like the 7D, but only 3.7fps continuous shooting mode frame rate. And it has 9 AF points and less complex auto focus options, like the 50D. It is fully capable of taking photos that are virtually the same quality as the 7D and the 50D, and if you don’t have intensive shooting and ego demands (ie, wanting the biggest, most expensive body whether or not you actually understand, need, or use its advanced features), it is worth seriously considering. But the 550D can’t have every feature and custom function of the higher level cameras, otherwise it would just be a 7D! If you are concerned about comparing image quality, ISO performance, auto-focusing speed, etc, all of these cameras have more than enough of what you need. You should instead be comparing the features and advanced options of the cameras which are most important to how you work. The top of the line camera won’t help you take better photos. But mastery of the tool that best fits your need just might (when combined with good knowledge of composition and lighting). I encourage you look at Flickr users’ photos taken with an “old,” 8MP Rebel XT to confirm this. Also, don’t rule out the Canon Rebel XSi if you are just starting out with digital SLRs. If you are comparing a 5D Mk II vs. 550D (5D vs. T2i) you are looking at a professional full frame camera vs. a consumer, entry level dSLR, and skipping 2 pro-sumer cameras in between. So while the features of the 550D are nearly on par with the 7D in many ways, the 550D vs. 5D MkII is an odd comparison that quite frankly confuses me. Are you new to digital SLRs? Get a 550D (or a 50D/ 60D if you wish to spend more money or need the higher frame rate for sports or photojournalism). Have you outgrown all the features, capabilities, or limitations after extensive use of a 20D, 40D or 50D? Get a 5D MkII. (Note that whenever I say 5D, I am referring to the 5D Mark II, the current model at this time). Are the images you’ve been taking with your Rebel or 40D no longer living up to your professional level needs in terms of dynamic range and noise at high ISOs? Get a 5D. Want to spend $2,400 on a camera body? Get a 5D. Want to spend $800 and still have a tool that is fully capable of taking professional quality images? Get the 550D. There are a few reasons why you would need a 7D or a 50D over a 550D / T2i. A major one is the advanced controls over camera settings. The more expensive models have additional buttons, controls, and displays on the exterior of the camera to enable quicker changes of important settings and easier viewing of what the current settings are. The 550D is capable of changing all these settings too, it is just done in a different way. For example, the 7D and 50D have the big dial on the back for quickly scrolling through menus, images, and for quick exposure compensation changes and changes of other settings. They also have the little toggle joystick on the back, primarily for quickly changing focus points. These 2 cameras also have the additional display screen and buttons on the top to easily view and change a number of settings such as ISO, drive mode, white balance, and metering mode – among others. These cameras are designed for a professional or advanced user who makes use of all these settings and needs to quickly change them while working. However, with a little practice, these settings can also be quickly changed using the buttons and big screen on the back of the 550D. The 7D and 50D also have advanced menus which give the user more customization options, like those discussed above (27 custom functions on the 7D vs. 12 on the 550D), and additional features desired by advanced users or pros, such as 1/3 ISO increments where the 550D has full increments (100-200-400 etc.). What you are also paying for with the 7D and the 50D are stronger, better constructed metal bodies to handle daily use and abuse as well as some weatherproofing of the buttons and doors. (However, Canon cameras have fallen from elephants and airplanes and have survived, so they are all generally pretty rugged. At pitcher of water was thrown on the back of my Rebel XT and it was fine.) All these features give the 7D and 50D a bigger and heavier body than the smaller, lighter 550D, which may be an important consideration for some users. Also, the 7D, and 50D have AF microadjustment capability, but the 550D does not. AF Microadjustment means that you can adjust the auto-focusing for each lens, in the camera menu, if they happen to front- or back-focus a little bit. I don’t think this is a very important feature, as I discuss above in Features. (The problem is that it is a maddening procedure, and you may get the focus exactly sharp for the center focus point at 15 feet at f/4, yet find that it is still off for the upper left focus point when you shoot under real life conditions that vary from those settings.) As I said above, if you need an excessive amount of AF microadjustment, you should probably send the camera or lens back for repair, calibration, or replacement. Or if you are that obsessed about pixels, you should be looking at a pro-sumer or pro camera and L series lenses. Finally, the 550D also uses SD type memory cards, while the other cameras all use CF, and the smaller battery of the 550D will not last for as many shots as the other cameras. Also, as I discussed above, be aware that the mode dials of the 7D and 5D MkII do not have most of the “basic zone” mode settings such as sports, portrait, and landscape. If you are starting to learn dSLR photography, these modes are helpful for seeing the results from different camera settings, and are good shortcuts until you have learned more about apertures and shutter speeds. Or if you never intend to use or learn more about the advance settings, the basic modes are good for helping you get better looking results than Auto or Program modes. So if you plan on keeping your camera set on Auto, Program, or the basic modes (sports, landscape, etc. ), start with the 550D or one of the other Rebels for now and upgrade later if you feel you have outgrown its capabilities. Your image quality difference between a 7D on Auto and a 550D on Auto will be negligible. So there you have it. You can read great, in depth reviews of each of these cameras on DPreview.com. There are probably numerous features and points that I forgot to mention, but hopefully this will give you a starting point in determining which features are important to you, and what warrants further research to help you in making your decision. The important thing is to choose one that fits your needs and budget, then stop comparing and get out and shoot! As I said above, your camera choice should be based on your level and needs as a photographer, and on which camera best serves the way you work. Whichever one you choose, I highly encourage you to get the the applicable Canon Guide to Digital SLR Photography from David Busch, or a similar book like the Magic Lantern Guides. They are much more user friendly versions of the camera’s manual, and will get you up and running quickly and assist you in fully understanding the settings, controls, and functions of your dSLR. If you plan to purchase any of this equipment or books, I encourage you to do so through the site I’ve set up with Amazon, Doug’s Picturing Change Digital Photography Equipment and Books. Purchasing through this site or one of the direct-to-Amazon.com links below will help support my blog and my work. Thanks! And for those of you across the pond, click here for my referral link to Amazon UK. If you are in another country, click on one of my Amazon links, scroll to the bottom of the page, and click on your country for your local Amazon. this is a great post (: very helpful evaluations and also weighing of costs and benefits! thank you so much. Have been deliberating between a 7D and a 5D Mk11 which to be honest the latter is a bit expensive for me. I am a keen photographer who had an old Nikon SLR 35mm in the past and currently have a Canon G10. My reason for upgrading to a DSLR is to take family pictures, my sons sporting events and general photos. I’m not one for leaving posts usually but having googled the web endlessly looking for comparisons and reviews on the cameras I am interested in and just wanted to say of all the reviews I have read I found your article extremely informative and helpful to my needs. Whilst I am still un decided you have educated me on areas I didn’t understand. Am now tempted by the Canon 550 with a good L series zoom lense but not sure if this would be quick enough for sports ? David, thanks for reading and for your kind words. I think a 550D with a good zoom lens (maybe the 24-70mm f/2.8L, 24-105mm f/4L, or the 70-200mm f/4L IS – the one with Image Stabilization) is an excellent choice. This camera would also give you the option of video. The 550D has many of the features, and virtually the same image quality (very similar sensor and same megapixel count) as the 7D. What it lacks vs. the 7D may be more applicable to shooting professional sports rather than kids’ sporting events: the 7D has more focus points to track the subject, more custom menu options to choose how it tracks and how it deals with objects that come between you and your subject, how it prioritizes shooting speed vs. achieving precise focus. These kinds of things matter to a pro shooter needing to capture the moment for a SI cover shot, but may not be critical to everyday use. Regarding speed, the one thing the 550D also lacks is the rapid burst speed of high speed continuous shooting mode. However, again, this may not be critical for your use. I personally think 5-6 frames per second is great for most action situations. The 7D offers 3fps and 8fps, neither of which I like – one is too slow, the other far too fast resulting in tons of unwanted images. The 550D offers only one continuous rate of 3.7, which is probably better for your needs. 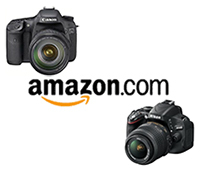 If you want a camera that might provide a middle ground between these two choices, you may want to wait for the 50D replacement – probably to be called the 60D. But there are only rumors and no real announcements of when that may be introduced. Probably in the next several months though. In reality, all of these comparisons are relative, since cameras will continue to improve every year or two. All the action images in the Dance section of my website http://www.dojoklo.com were captured with a Rebel XT, and every one of its specifications are far inferior to those of the 550D, including frame rate speed, auto focusing, number of focus points, and image quality. So I think the 550D is a highly capable camera for sports and action. Consider the features that are most important to you, then go to a camera store and try them out side by side, comparing those features (focus points and subject tracking with auto focus, continuous shooting speed). You can also compare the size, weight and comfort of using the cameras. Let me know if you have further questions I can help you with.